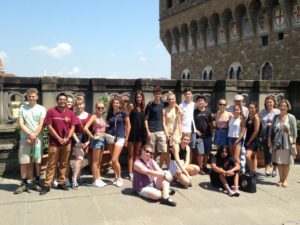 even South Valley teens enjoyed the trip of a lifetime when they journeyed to the Italian Province of Florence and toured the region for nearly three weeks in local family homes in San Casciano in Val di Pesa, a Sister City to Morgan Hill. The students left Morgan Hill on July 16 and returned Aug. 3. The Italian host families had teens who helped show the American students their culture and way of life. Morgan Hill residents Amy Whelan and Pier Antoniucci served as chaperones. 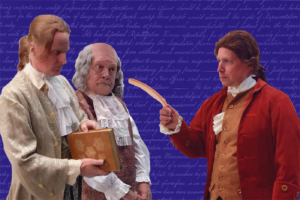 Watching wood craftsmen create a range of items used throughout history, both day-to-day items, like chairs, and wooden ornaments that embellished some of the frames on the regions’ most important art. Several days were filled with excursions outside of San Casciano, including an overnight tour in Rome, and day trips to Tuscan cities Pisa, Siena, Florence, and San Gimignano. The students visited to the American Cemetery and Memorial, which honors American soldiers who died fighting in the region during World War II. The cultural exchange program overlapped with the 74th Anniversary of the liberation of San Casciano by the U.S. troops. The Morgan Hill visitors were also treated to the local olive oil, most notably, that of the Azienda Agricola Mori Concetta, a family business specializing in both olive oil and Chianti wine. The business has earned several national and international distinctions and awards for its excellence, Whelan said. 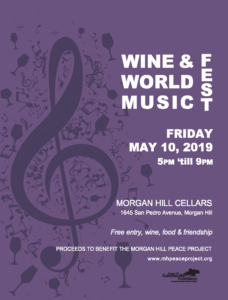 Besides San Casciano, Morgan Hill’s other Sister Cities include Seferihisar, Izmir, Turkey, San Martín de Hidalgo, Jalisco, Mexico, Mizuho, Tokyo, Japan, and Headford, County Galway, Ireland. Sister Cities of Morgan Hill is under the fiscal sponsorship of the Morgan Hill Community Foundation. 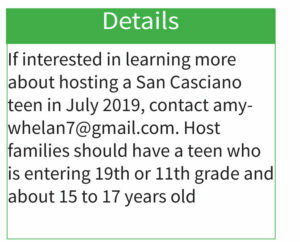 In July 2019, Morgan Hill families will host Italian teenager from San Canciano. Residents interested in finding out more about hosting an Italian teen can email amywhelan7@gmail.com. Host families should have a teen who is entering 10th or 11th grades and between 15 to17 years old. The nonprofit organization Sister Cities International believes in giving anybody interested a chance to connect to the world, especially young people, Whelan said. A student exchange program is also done with Mizuho with middle school-aged children. Among the Morgan Hill students who visited San Casciano, Ulises Alcalde, 18, a senior at Live Oak High School, described how visiting the ancient Italian town of nearly 9,000 gave him a chance to explore the culture and personally see how beautifully unique the region of Tuscany is. While in Italy, Alcalde gained an appreciation for the country and its citizens’ daily style of life. The lifestyle that many young teenagers have in Italy fascinated him. 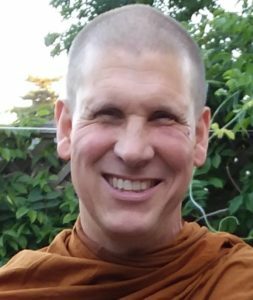 Traveling helps young Americans gain an appreciation for many things around the world because every country is different and beautiful in its own way, he said. Americans can learn about the different cultures and how to respect them and see the beauty of it. Niah Carrender, 17, a student at Ann Sobrato High School, also enjoyed his summer trip through the Sister Cities program. He especially enjoyed the architecture and the history. “Seeing places within San Casciano — even a tower more than 1,000 years old — and cities like Rome, Pisa, and Siena, it was very interesting to be in a place where all the buildings have such a long history,” he said. One interesting thing that he learned about Italy is that teens can get a motorcycle license at 14. “It gives them a lot of freedom, especially in a smaller, drivable town, like San Casciano,” he said. Robert Airoldi is the editor of Morgan Hill Life newspaper. If you have a story idea or an Around Town column item you want to tell him about, you can reach him at (408) 427-5865 or at editor@morganhilllife.com.